You’ve done your homework before the successful launch of your company’s medical device blog. But after a few months, you notice a plateau. Current blog visitors are engaging with your content, but sessions remain relatively the same from month-to-month. Your list of blog subscribers is substantial, but the initial increase has subsided, with only one or two recent additions. Don’t let these frustrations interrupt your efforts. As we’ll showcase here, there are plenty of ways to extend the reach of your medical device blog to a broader audience. You already have insight into the problems your audience is trying to solve. But what types of search words and phrases are they using to actually get answers to these problems? By working with an SEO or demand generation team, you can determine which terms and phrases to target on your medical device blog. 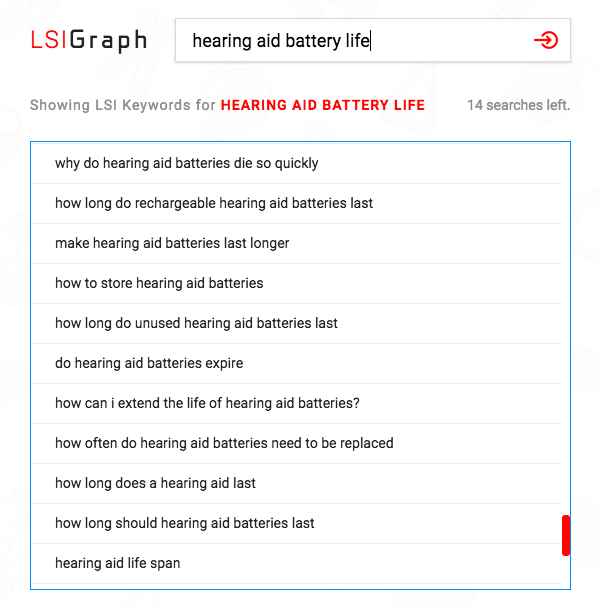 In the case of a hearing aid designer and manufacturer, “hearing aid battery life” may be a point of focus. Naturally incorporating this keyword and its variants (latent semantic indexing keywords) into blog content can help boost your search rankings and organic traffic to your website. These SEO efforts are complemented by other tactics, as well. This includes optimizing content for readability, linking to reputable sources and creating dynamic meta descriptions that capture the attention of readers. 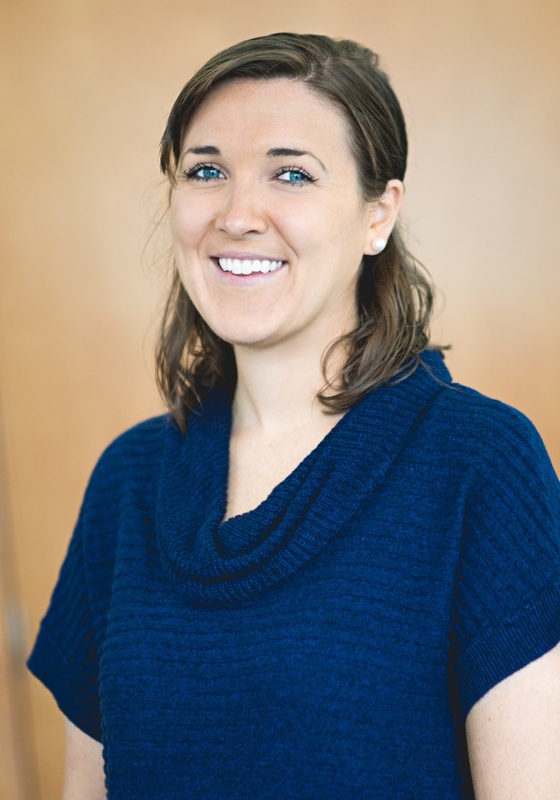 Of the 67 percent of physicians who have social media accounts for professional use, over half consider it as an effective means of accessing up-to-date, high-quality medical information. For medtech companies, this not only showcases the value of having a strong social media presence, but also the benefits of integrating it with your blog. Building the connection between your medical device blog and social media might also include website updates. Adding social media buttons relevant to your audience will allow readers to share your content, while tools like Clicktotweet give you the chance to promote specific quotes. In an increasingly crowded online world, paid media offers that extra boost to get your medical device blog content noticed. Along with opportunities to reach a brand new audience, you can also re-engage with people who have already interacted with your brand. Take Facebook ads, for instance. 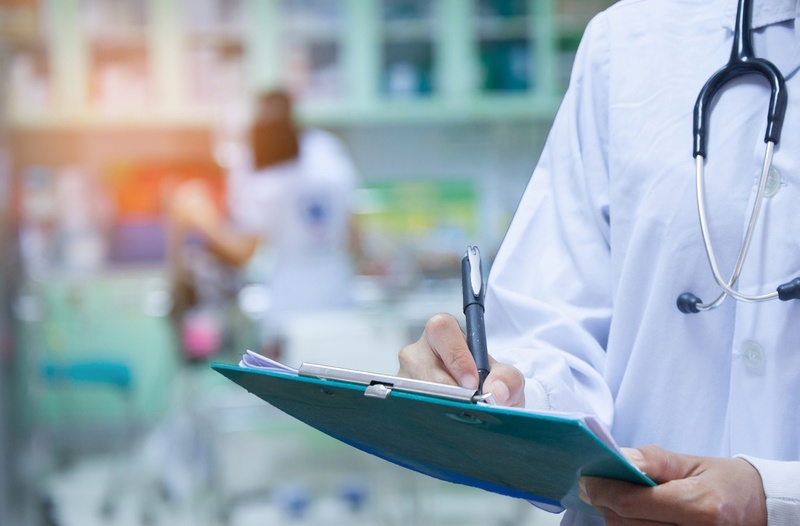 As a medical device manufacturer marketing to pulmonologists, you can build core audience lists around this job title, while accounting for other factors like age, workplace, location and purchase behaviors. Custom audiences, meanwhile, allow you to foster relationships with current website visitors and seal deals with prospective and current customers. Another route to utilize is Google ads. When a prospect searches for one of your targeted keywords, your ad can appear at the top of the search engine results page, helping drive audiences back to your website. As is the case with Facebook, compelling copy and routine optimization are all crucial to the success of these ad campaigns. Not every blog post you publish needs to go on your website. By publishing posts on other websites, you can take advantage of an existing blog community and reach a new—and potentially, larger—audience with your content. Guest blogging also gives you links back to your own website, which boosts your domain authority and can increase where your pages rank in search engine results. For guest blogging to be most effective, look for websites that are popular, related to your business and have high credibility. Such relationships can emerge from established industry connections, networking via social media or Google searches around your field. Say your medical device company sells dialysis equipment. 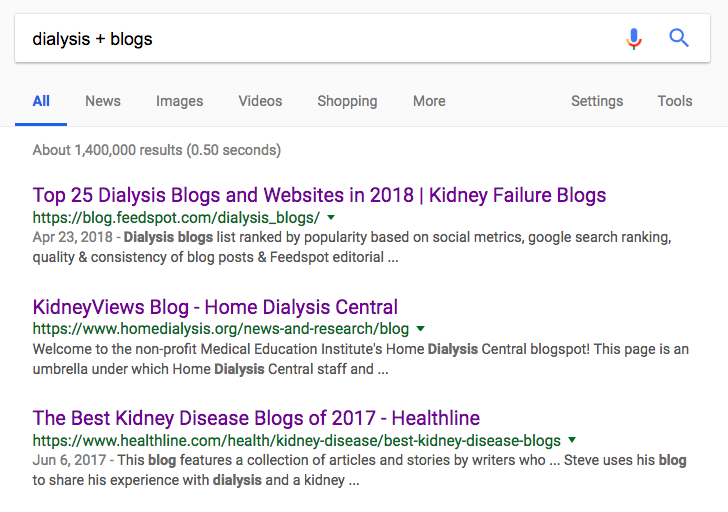 By searching for “dialysis + blogs”, you can quickly find blogs relevant to your industry and then check to see if they have a guest post system in place. Even if they do not, avoid ruling out these opportunities—it just means you may have to sell them more on your idea. Next to high-quality content, link building is the most important signal that Google uses to rank your website for search. While it is one of the hardest parts of SEO, it is also one of the most beneficial in terms of building relationships, establishing your brand and driving new traffic to your blog. The foundation of this strategy is to create blog content people find useful and share-worthy. This will encourage natural links from website owners that offer real SEO value to your medical device blog in the long term. The emphasis here is on earning links. Focus on tactics that drive valuable editorial links versus unnatural link-building tactics that provide no real value to your website. In fact, Google has started to penalize websites that use link schemes, such as buying or selling links, which can contribute to a loss in rankings. Examples of good link building tactics include writing guest posts (as mentioned above), networking with partners and establishing a scholarship page. Tactics you’ll want to avoid include purchased links, link exchanges with no industry relevancy and low-quality directory listings. Blogging is both an art and a science. With the right balance of creative, optimized content and innovative tactics to extend your reach, your medical device blog is on track to connect with the right audience and inspire them to take action. To learn more about how to survive and thrive in today’s digital world, download a free copy of our eBook, Owned, Earned & Paid Media Strategy for Healthcare Companies.